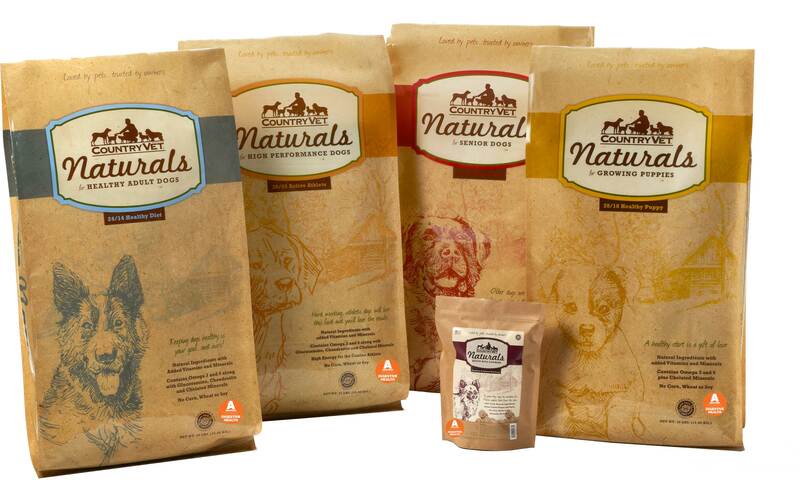 BioZyme Inc. has become a distributor for Country Vet® Naturals dog food line available in four formulations for: Healthy Adult Dogs, Growing Puppies, High Performance Dogs and Senior Dogs. Research tested to improve overall canine health, appearance and appetite, Country Vet Naturals contains added vitamins and minerals and no fillers such as corn, wheat or soy. Each formulation also contains BioZyme’s proprietary Amaferm® — a natural feed additive that acts as a prebiotic to increase digestibility and maximize energy. Amaferm has been research proven to have significant health benefits to dogs. In a Professional Kennel Research Trial of 157 dogs fed Amaferm, scientists reported a 26% improvement in general health, 74% improvement in skin and hair quality, 14% improvement in stool consistency and 67% improved appetite. Additional natural ingredients contained in each formulation include chicken meal, brown rice, brewer’s rice, pork meal, fish meal, dried beet pulp, dried egg product, fish oil, yucca schidigera extract, dried chicory root, and others.